Safety Eric Reid, seen here at right kneeling before a San Francisco 49ers game last November, has signed a new contract with the Carolina Panthers, ending his free agency. 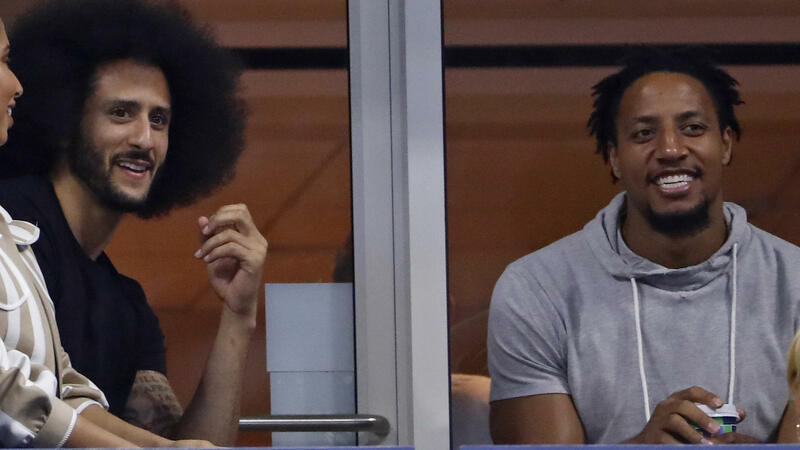 Eric Reid (right) has signed a one-year contract with the Carolina Panthers. He is seen here last month, watching the U.S. Open tennis tournament with former San Francisco 49ers teammate Colin Kaepernick. 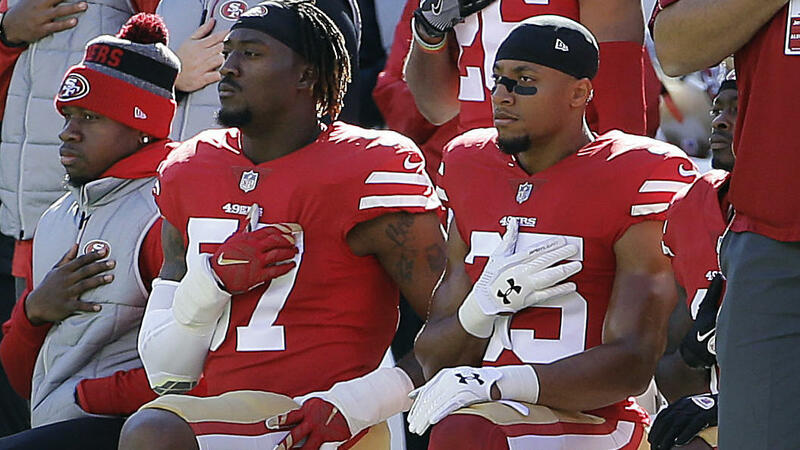 In San Francisco, Reid was the first player to kneel alongside Kaepernick — and earlier this year, Reid filed a grievance against the NFL and its teams, alleging they colluded to punish him for his social advocacy. After news of Reid's signing, Kaepernick sent congratulations via Twitter, saying, "Congrats 2 my brother ... who should have been signed the 1st day of free agency." Kaepernick called Reid "a social justice warrior" who is driven to help others. The Carolina Panthers (2-1) signed Reid on Thursday, posting videos and images touting the new addition to their defense. The Panthers' players soon followed with their own messages, welcoming Reid. Wide receiver Torrey Smith — who two days ago was urging the Panthers to sign Reid, after losing safety Da'Norris Searcy to injury last week — said on Thursday, "There is never a wrong time to do the right thing." Carolina General Manager Marty Hurney said that after he and head coach Ron Rivera checked out their options to fill the spot, "Eric was at the top of our list. He is a physical safety with good ball skills and play-making ability." Hurney added that while he was on a trip during Reid's signing, "the sense I get is that he's very excited to play football." The Panthers were listed at No. 5 on NFL.com's power rankings this week. After the team announced its signing of Reid, many of the responses on Twitter were excitedly positive. One fan asked if this might be the best Carolina defense in its history. Another simply asked when Reid's Panther jersey would be available to buy. While Hurney said Reid would help the team, he added that it is not yet certain when the safety will see action. The Panthers are currently on a bye week; their next game is on Oct. 7. "He'll come in and take part in practice Monday, and it will be a coaching decision as to when they think he'll be ready to go," Hurney said. The NFL Players Association also congratulated Reid, with its president, Eric Winston, saying, "Our union is proud to stand by one of its strongest player leaders and we congratulate Eric for making it back to doing the job he loves."